This is actually an HD remake of the original Tony Hawk's Pro Skater and its sequel, Tony Hawk's Pro Skater 2. It updates the graphics to make the game look even more impressive, with an entirely new engine built to bring things right into the modern era. It's a great little package which makes for an ideal introduction to the world of video game skateboarding so if you've never tried such a game before, this is a good choice. 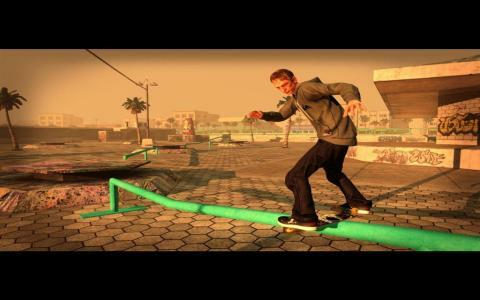 The essential gameplay sees you skating around a series of vast open environments, pulling off tricks from whatever you can find and which help you to rack up cash and points. You also have objectives to unlock things faster and which also helps to progress and open up new areas. There's a few new things here too, including Big Head Mode, where your head gradually grows bigger and bigger until it explodes and only pulling off combos can stop it. Hawkman requires you to pick up pellets by performing specific moves while Grafitti sees you coloring in your environment with tricks. For skating fans, this is a pretty solid update that's well worth picking up, although probably only if you haven't played the original two games that it's based on. The biggest change is the visuals and although they're certainly better than their predecessors, they do look a little dated now, with some rough edges and crude textures. The gameplay however fares very well and it's still highly compelling skating around and pulling off trick and trick. The controls are easy to get to grips with but very flexible while the presentation is spot on, making this an enjoyable piece of skating action.